This is one excruciatingly painful movie to watch, what makes this shocking is the added voice overs, bringing it to stark contrast what happens to these people, people who you have just watched happy go lucky as any individual you are likely to come across from Latin America. 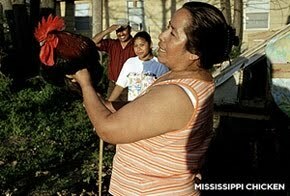 This is a real life documentary where an activist for the workers at the Mississipi Poultry farms spends a short amount of time with Gehemina and her daughter Rosario, you will love them immediately, the happy Rosario who doesn’t know what to do with her life but as any fourteen year old is happy to be playing about, there is a lovely scene where she is celebrating her fourteenth birthday and everybody in the trailer park where her and her mother stays, have come to sing her happy birthday, and at the end of it her face is embedded in the cake(seems this is a Mexican tradition for the birthday individual to have their face embedded in the cake). You can’t watch this without feeling for the people, these are some of the warmest friendliest people you could come across, ready to open their doors to a stranger, and offering their hospitality yet having nothing, even the trailer park Gehemina lives in is delapidated, the floor boards are moist and easily broken off, and the whole trailer is filled with cockroaches, and as with many people who maybe know their rights but are too scared to cause trouble, or alert the authorities (perhaps there is an illegal immigrant in the vicinity and asking for help via the law could bring unnecessary trouble and unwanted attention to them), she doesn’t want anyone confronting the owner over it, as he has already told her “If you don’t like it leave.”! This documentray shows the exploitation going on in contemporary Mississipi on the Poultry farms, from previously using blacks to now hiring Latin American workers, who hardly speak the language and who don’t know their rights, some of the stories are heart renching, from the group of guys who have done construction work and are owed $6,000 while the individual who owes them this large amount of money when confronted, comes with his advisor and says he has just come out of jail and will pay in two weeks, and two weeks passes then his wife phones that he has broken his arm and is on morphine(while the absolutely-superb-bunch of guys who have done the work and are owed their money says they will even accept one dollar as part payment if the fellow is telling the truth! ), to Gehemina herself having worked for a stipulated $50 a day for two weeks only to be paid $200, while she found out later that the manageress kept the money for her and the other workers, to the corrupt cop who targets Mexican workers between the hours of 2 p.m. and 10 a.m. to extort them for made up traffic offences. But it is not all doom and gloom, the hard work being done by the campaigner for the Poultry Farm workers goes beyond the call of duty, and her and the local Parish workers will no doubt gain the much needed publicity this area and line of work deserves.